I saw The Killer rip it up atop his piano in 1957 to close the show at Alan Freed’s Brooklyn Paramount after Screaming Jay Hawkins rose from his coffin to put an eternal spell on me. That same year I saw Althea Gibson make everlasting history by winning the Women’s Tennis Singles Final at the old Forest Hills. I was alone with my idol Elvis at a Vegas crap table in the early 60s, greeted there by sad eyed former Heavy Weight Champion Joe Louis, played pool with Keef, shared the Fountainebleau swimming pool with Jayne Mansfield, lost all my money playing crap with Sammy Davis Jr. in his dressing room, danced with a Shirelle, held a (heavy!) Oscar, ran the Boston Marathon, finished a race in Central Park holding upraised hands with Road Runners Club founder Fred Lebow. Lou Reed performed at my basement New Year’s Party In 1962/63. I saw the Beatles cause screams beyond my decibel limit 2 nights in a row at the Forest Hills tennis venue in 1964. I saw the Mick (Key Man) in many Yankee World Series games in the 50s and early 60s. I saw Johansson knock out Paterson for the Heavy Weight Championship outdoors at Yankee Stadium. I was at the after party for Taxi Driver. Sophia stared at me at Studio 54. I was in the first row at Wembley for Live Aid. 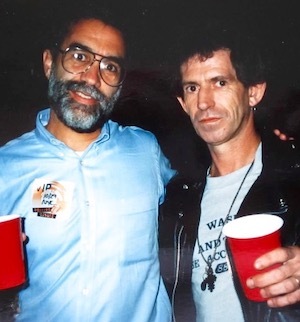 I was back stage with the Stones in 1989. I stood by as Bowie came on to Jo. I was behind security at the Friars Club Roast of The Donald and took pictures of his hair. Quite an impressive resume of memories. More to come? Amazing list. Elaborate on Lou Reed please!? Wow! I'm looking forward to the next list. Wow! And that was before selfies!! More to come! What I love is that it’s a variety of people and places. You walked into the party like you were walking onto a yacht... You’re hat strategically dipped below one eye Your scarf it was apricot .... So Derf .... This is your stage and not to UP stage you ..... I’ll go another route . I’ll fly my Lear jet up to Nova Scotia to see a total eclipse of the sun .... Did I tell you we were kindred spirits ? Zelig #1 and Zelig # 2. I see us circling the globe in orbit challenging the Gods to compete with us . The stories never end and fill the void . How far can you hit a 100 mph fastball on the surface of the moon ? Did I tell you I was engaged to Mickey Hargitay ‘s next wife ? Yeah I think I did . But you can read that in my book . Zelig #2 . Are you sending a Ghost Writer or a Ghost Rider ... say Frankie Laine ? This might be over the head of most of your fans but it doesn’t matter . They were clouds in my coffee . Oh yeah my date with Carly Simon ? Read the book . Let's start a new lunch group of Zeligs. You must have at least 5 verified incidents to belong. I was also in attendance in 1958 for “The greatest game ever played”, the Football Giants loss to the Colts in OT. What Awesome life experiences/memories. Elvis OMG. My idol too. Lets see what’s next for FRED. Living the Great life!!!! you did not mention something closer to home. Would make a movie, all you have to do is think of the point. Think of a name and you will have the point. There must be a point - this doesn't happen to everybody.